Harvard Business School (HBS), home to one of the world’s first established MBA programs, was founded in 1908. HBS lies on a 40-acre campus in the Boston neighborhood of Allston. Along with its full-time MBA program, HBS offers eight doctoral programs and 77 executive education opportunities organized across topics including Entrepreneurship, Healthcare and General Management. 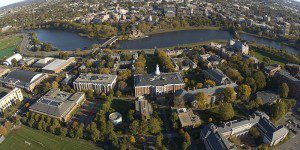 Dual degree options include a JD/MBA, an MD/MBA and a DMD/MBA, all offered in conjunction with other Harvard graduate schools. HBS also partners with the Harvard Kennedy School of Government to offer a Master of Public Policy/MBA and a Master of Public Administration-International Development/MBA. The business school is accredited by the Association to Advance Collegiate Schools of Business International. Harvard Business School’s campus in the Boston neighborhood of Allston is located across the Charles River from Harvard University’s main Cambridge grounds. The HBS campus is just off of Route I-90 and is a 10-minute drive away from downtown Boston and I-93. Access to center city Boston is possible via Amtrak train. As well, transportation to Logan International Airport from the school only takes around 30 minutes. Harvard Business School classes, offices and housing units are all located on the 40-acre Allston campus that features 34 buildings dedicated to the school’s use. Facilities include the Baker Library; Spangler Center with its 350-seat auditorium, post office and business center; the Class of 1959 Chapel; and Soldier’s Field Park, an apartment complex for HBS students. Classes take place primarily Hawes and Aldrich Halls, located next to the library in the center of campus. There are 266 faculty members at HBS, 67 of whom are women. Faculty members and their research are organized across 10 different academic units: Accounting and Management; Business, Government & the International Economy; Entrepreneurial Management; Finance; General Management; Marketing; Negotiation, Organizations & Markets; Organizational Behavior; Strategy and Technology & Operations Management. Currently, Harvard Business School enrolls 930 MBA students with a yielding acceptance rate around 9.5 percent. HBS offers a full-time MBA program with one intake each year beginning in the fall.